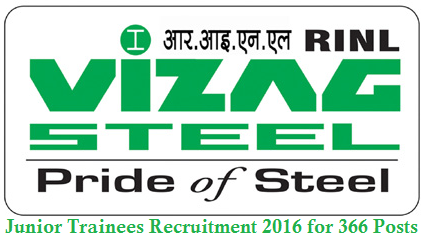 Vizag Steel Plant Recruit the vacancies under Ministry of Steels, RINL -VIZAG STEEL PLANT a Navratna Company under the Ministry of Steel, Government of India and India’s first shore-based integrated Steel Plant, people who want apply for this steel plant junior trainees jobs, they have to memorize these jobs related to the central government jobs. Following number of posts are reserved for SC, ST, OBC and Ex-servicemen on overall basis. Candidates have to download the application fee challan from the vizag steel plant official website www.vizagsteel.com, and then the application fee amount must be deposited/ credited to the RINL Recruitment Account No. 30589461220 at any of SBI Branches. Candidates have to pay 300+25 bank commission. Selection of Candidates will be through Written Test and Interview. Applied Candidates will have to appear for the written test at their own cost. Written test will be conducted at test centre(s) in Andhra Pradesh, Most probably schedule for Written Test is during the month of February 2016. 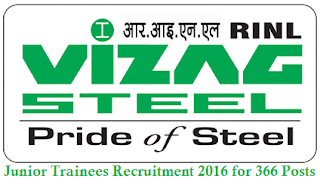 After application verification the list of eligible candidates for written test will be put on the website www.vizagsteel.com under the link “Careers” by 01.02.2016.